This morning on my Saturday sojourn into the Mission I had two encounters that reminded me of how much I still love this neighborhood. On Mission Street, I walked by the market in the parking lot at Arribas Juntos. The market is so popular that other folks selling their stuff from cars and on the sidewalk extend the selling by a block. Walking past I noticed a huge bottle of Courvoisier at one spot and an equally large dragon vase at the spot next to it. 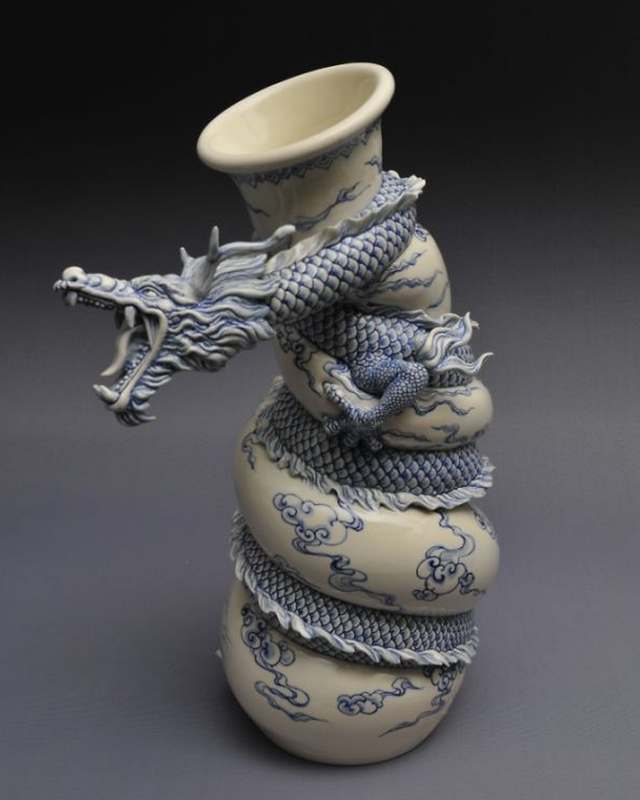 The dragon vase was so great I stop to take a picture of it when the guy it belongs to says, “NO!” I ask him why not and he answers, “$1.” It takes me a second before I realize what he’s saying and it cracks me up, I can take a picture if I pay him a buck. As it turns out the Courvoisier belonged him too, tells me I can have it for $5. Too bad I’m a teetotaler. On the way home up Valencia, I witness the end of a traveling couples argument when the guy pulls a map out of his back pocket and hands it to his female companion. She stops walking as he carried on never looking back at her. My sympathies were with her. Two blocks down a black man steps out of a doorway dressed in a navy blue pinstriped suit and a red hat on his head at a jaunty angle. The ensemble was completed by an overcoat hanging over his right arm. I slowed so I could take him in a bit longer. After all, you don’t see this sort of sartorial rhetoric mid-afternoon in San Francisco every day. Catching up to him as the light changed I tapped him on the shoulder, “You’re lookin pretty sharp, you’re making the rest of us look shabby.” He smiled as he considered me, dressed in my best smelly old tramp costume, and initiated a fist bump, in which I had to quickly avoid the gigantic diamond pinky ring he was featuring. See, the Mission has still got it.